Equal Rights Amendment Archives - Read. Think. Act. 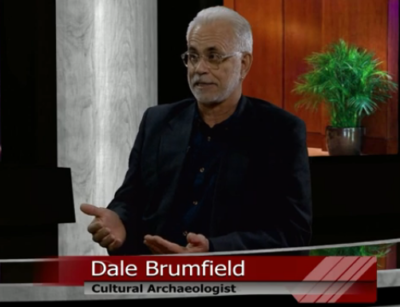 (Jan. 16, 2019) Catherine Read sits down with Cultural Archeologist Dale Brumfield, for a discussion about the history of the women’s liberation movement. As Virginia kicks off the 2019 legislative session, the Commonwealth is poised to be the 38th state to ratify the Equal Rights Amendment to the US Constitution. Brumfield provides some history and context of the movement, and what brings us to this moment in time. Brumfield begins by sharing the history of the women’s liberation movement. It was sparked in 1968, when the leftist hippie counter-culture movement was getting started. Women were brought into the coalition, to essentially provide cover for the men when dealing with the police during protests. When marching or protesting, the men who ran the movement would put the women up front in the marches so that the police would not attack them or use tear gas. When the women started to understand the dynamics of their situation, they decided to break from the ranks and start their own movement. During the 1968 Miss America pageant, women waged the first large group protest of the movement, coming together to denounce the entire premise of the beauty pageant. The New York Post falsely reported that women were burning their bras, when in reality they were tossing them in the ceremonial “freedom trash can”. Women in support of the women’s liberation movement were forever stereotyped as “bra-burning” radicals. The bad press was hard to shake, so the women decided to take control of their own messaging. Marilyn Webb, a Virginian, was at the head of the movement at the time. She ambitiously founded Magic Quilt in 1968, designed to help organize the disparate women’s groups nationwide, and help mobilize and the ranks. The task proved to be too daunting, and she did not succeed in establishing Magic Quilt as the umbrella organization for the women’s liberation movement. She did, however, successfully launch the first news magazine that was dedicated to women’s issues called “Off Our Backs”. Many people think that Gloria Steinem with Ms. Magazine was the first feminist publication of its type, but “Off our Backs” hit the printing press in 1970, several years before Ms. The magazine was meant to set the stage for, and define the narrative about, women’s issues. Much of the coverage of the movement by the mainstream media was negative, so the purpose of the magazine was to change the tune and offer an alternative voice. At the time, Webb was unable to find anyone in Virginia to actually print the magazine, so they traveled to Atlanta to find a publisher. Off Our Backs continued publishing for 38 years, although they eventually transitioned to online publishing before closing shop in 2008. Archives of the publication can be found online. Throughout the history of the United States, women have had to fight for equality in so many ways. From suffrage, to entering the workforce and even being able to own their own credit card without their husband’s co-signature, women have had an uphill battle every step of the way. Brumfield notes that it is challenging to maintain a movement over a long, sustained period. There are certain moments in time that spark a light to continue the fight. Many women found the 2016 election, and the #metoo movement that followed, to be such a moment. Women have been inspired to take things into their own hands, and run for office in record numbers on the local, state and federal level. Here in Virginia, we elected three women to Congress in 2018. As women continue to get elected and hold office, he believes that progress will follow. (update: The State Senate passed the ERA amendment on the first day of session, however the House of Delegates voted the bill down in committee, along party lines). 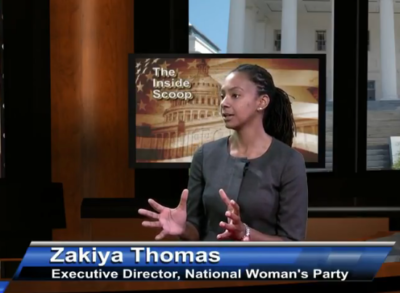 (Oct. 8, 2018) Catherine Read interviews Zakiya Thomas, Executive Director of the National Woman’s Party (NWP). Founded in 1913, the NWP originally focused its work on the passage of the 19th amendment to the Constitution, giving women the right to vote. As the centennial celebration of the 19th amendment approaches, the NWP is being reimagined to continue the fight for women’s equality envisioned by their founders more than 100 years ago. The founder of the NWP was Alice Paul, who dedicated her life to the advancement women’s rights and equality for all. After the successful passage of the 19th amendment, the NWP went on to push, with laser-like focus, for the passage of the Equal Rights Amendment. The NWP lobbied on the Federal and State level, and successfully got the measure passed on Capitol Hill and ultimately in 37 states. Thomas is now hoping that her home state of Virginia will be the final state to put the measure forward. Although the NWP used to be primarily a lobbying outfit, they recently became a 501C-3 nonprofit organization. Their mission now is to build a coalition, and work arm in arm with the community to inspire action and advance women’s equality. Zakiya Thomas comes to the NWP with a wide variety of experiences that makes her well suited to lead the organization into the future. After a successful academic career at William and Mary and Columbia University, she ventured off into the world of consulting. As she traveled the world and the country, she began to understand how policies affected people. She chose to work to advance good policies and the people who make them, to in order to have real and deep impacts on her community. 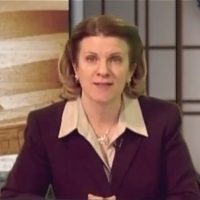 This led her to organizing the successful campaign of Sheriff Stacy Kincaid, the first female to be elected Sheriff in the 276-year history of Fairfax County. Sheriff Kincaid has transformed her office to have her officers be more engaged in the community, has implemented a Diversion First program designed to help officers recognize people with mental illness, and has pushed for increased educational opportunities for inmates. Thomas believes that by helping to get Kincaid elected, she has helped to improve the lives of those living in Fairfax County. After achieving success in 2015 with Sheriff Stacy Kincaid, she moved on to manage the campaign of Lt. Gov. Justin Fairfax in 2017. Fairfax was the first African American to be elected to the post in the commonwealth’s history. He was a descendent of a slave who was freed from Lord Fairfax, the original landowner of Fairfax County. Thomas is proud of the work she has done to help elect these two public servants, and is pleased to see how they have made impacts for the people who they represent. Today, Thomas plans to lead the NWP by inspiring its partners nationwide to adopt policies that help advance women’s equality. While the organization is a nonprofit and cannot lobby Congress or State Legislators for specific measures, they can be a resource for those who do. Their goal is to highlight the history, including their vast collection of historic documents and artifacts, to spark a conversation about the women’s equality movement. Their headquarters at the Bellmont House on Capitol Hill is now listed as a historical monument, and is managed by the National Park Service. Tours are given of the Bellmont-Paul Women’s Equality National Monument, and it will serve as a centerpiece in the 100th celebration of the 19th amendment. Thomas also plans to “take her show on the road”. She is working hard to establish relationships and partnerships with organizations nationwide, and plans to bring the collection out into the community. The broader goal is to work with these partners to amplify their voice and spark a national dialogue about equal rights for women, as well as expand programming and conversations around the Equal Rights Amendment. Their first stop will be in Charlottesville, where she will be speaking with a League of Women Voters about Diversity Inclusion in the fight for equal rights. They also have a variety of events planned locally, including books talks about Code Girls and For Colored Girls Who Have Considered Politics. The website has further information about these events. Many are not aware that the very first March on Washington was the Women’s March for the Vote, held on Pennsylvania Avenue on the eve of Woodrow Wilson’s inauguration in January of 1913. In recent years we have seen the rebirth of the Women’s March, and the NWP is looking to raise their profile during these events. This year’s Women’s March will be held on January 19, 2019 and Thomas indicates that the NWP will be looking to plug into programming and use this event to reintroduce the NWP to the public. Thomas wants everyone to know that the NWP is recommitted to the cause, has a new, fresh look and is ready to bring the NWP into the 21st century.